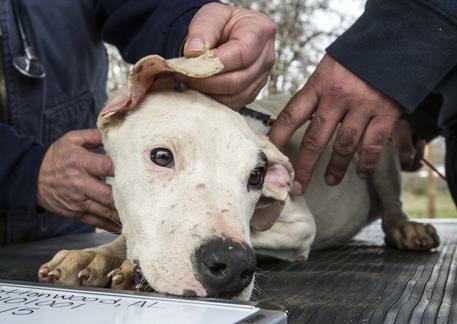 NSA) - Palermo, August 16 - An eighteen-month-old boy was mauled to death by TWO DOGO ARGENTINO (Argentinian Mastiff) dogs at Mascalucia near Catania Tuesday. The boy's mother, who tried to protect her son, was injured. The toddler was 'coptered to hospital but was pronounced dead on arrival. The dogs have been impounded by local authorities. The mother, 34, who was alone with her son when the dogs attacked, has been placed under investigation in what police said was a formality needed for the autopsy. "Today is a tragic day for Mascalucia," Deputy Mayor Fabio Cantarella said on Facebook. The Dogo Argentino is a large, white, muscular dog that was developed in Argentina primarily for the purpose of big-game hunting, including wild boar. Its breeders also wanted a dog that would exhibit steadfast bravery and willingly protect its human companion to the death. It was first bred in 1928, from the Cordoba Fighting Dog along with a wide array of other breeds including the Great Dane. In the 1920s the Argentine Dogo was developed in Argentina by Dr. Antonio Nores Martinez and his brother Agustin. The brothers wanted an ideal companion dog that was also a good pack hunter and guardian. The breeds that were used in the development were the Great Pyrenees, Irish Wolfhound, Pointer, Great Dane,Dogue de Bordeaux, Boxer, Spanish Mastiff, Bulldog, Bull Terrier and a now extinct mastiff-type breed called the Dog of Cordoba. These damn dogs kill little children the same way they kill each other. Why can't people see they don't belong with humans as pets? They are fighting dogs. I'm struggling thinking of another innocent child destroyed by a nanny dog.